Responsibility to Protect Civilians | Hayat Alvi, Ph.D. When I lived in Damascus, at the time the TV had only two channels. One of them used to broadcast Russian ballet performances quite regularly. Also, Iranian pilgrims were everywhere. An entire segment of the Syrian tourist industry has been set aside just for Iranian pilgrims visiting important Shia shrines. I saw busloads, and I even learned that certain hotels were exclusively serving Iranian patrons. (NOTE: You can find the hyperlink to the video inside Michael Weiss’s article: http://blogs.telegraph.co.uk/news/michaelweiss/100135384/russia-iran-and-hezbollah-are-already-intervening-in-syria-why-arent-we/ — WARNING: It’s very graphic). “Vladimir Putin’s copper-bottomed support for Bashar al-Assad at the UN Security Council can be taken in one of two ways. There will be those who claim that here was one organized crime lord pledging solidarity with his human ferret counterpart. The two men really do understand each other and are even beginning to replicate each other’s CVs. Assad is doing to Syria what Putin did to Chechnya a decade ago and under the same pretext of combating “terrorists”. Moscow had its dodgy apartment bombings in 1999, blamed with credible evidence on the FSB, to justify the razing of Grozny. Damascus has had its spate of “suicide bombings” lately, blamed by the regime on the following actors: al-Qaida, the United States, Israel, the Muslim Brotherhood, the Syrian opposition and loyalists of former Syrian Vice President Abdul Halim Khaddam. Footage showing the mukhabarat’s theatrics before and after these incidents matters not at all because the Assad regime, with a little help from Russia Today and other Kremlin mouthpieces, has also blamed “foreign media” for presenting a mere domestic misunderstanding as a full-blown humanitarian crisis. Taken another way, Putin’s support for Assad is a foreign policy “victory” that comes at just the right time for Russia, weeks ahead of a presidential election. …If certain comment editors have difficulty finding Syrians on the ground who want NATO fighter jets overhead, I’ll be glad to introduce them to several. You don’t need me to point out that the United Nations has miserably failed the Syrian people. The UN is broken and is far from democratic. If anything, this whole incident underscores the need for a UN overhaul; at a minimum, there should be provisions for those countries that wish to implement the R2P mandate in cases such as Syria to override Security Council vetoes. I am a diehard believer in state sovereignty, but I am a human rights activist first and foremost. Russia, Iran, and China have done a tremendous disservice to humanity. Now, Assad is having a field day in exterminating his own people: protesters and by-standers alike, civilians making a run for it to grab some bread (now in dire short supply), families huddling in their homes, and individuals picked off by snipers. This reminds me of the bloody, ruthless killings in the former Yugoslavia. The Yugoslavia analogy is not off base… remember how long it finally took Western powers to intervene in Bosnia and stop the massacres?!! You’d think that we all have learned from lessons past. The Syrian people have the right to live without fear. Most of all, they have the right to live. What the hell happened to the “Responsibility to Protect” civilians, that was so potently invoked in the case of Libya? I write this with a very heavy heart for Syria, and wish that ballet performances would have been the extent of Syrian-Russian relations. Sadly, it’s not. This is obviously a catch-22 situation for both the anti-Assad activists and opposition groups, as well as for the Assad regime, and even for the international community. Hypothetically, if there is an R2P (“Responsibility to Protect” civilians) mandate implemented by the UN in Syria, much like the Libya case, there is no guarantee that civil war will not occur. In fact, that is exactly what happened in Libya. And, as far as I can tell, the early stirrings of civil war have already rippled inside Syria. Yes, the odds against the Assad regime will stack up upon applying the R2P mandate, assuming it involves a no-fly zone and NATO-led airstrikes, as in Libya. But, it does not mean that the civil war would be any less bloody. In fact, the Assad regime will have the opportunity to accuse external powers of interfering in Syria’s internal affairs, and he’ll no doubt point his finger to them and say, “See, I told you it was foreign agitators all along” (not that the opposition will believe him, of course!). Syria faces a delicate dance, because, unlike Libya, the Syrian government has strong allies, Iran and Russia to name the top two. And, the Assad regime can manipulate proxies in Lebanon to widen the conflict. The stakes are extremely high for the opposition groups as well as the Assad regime. The international community’s potential role can either be a game-changer, or the fuse that further intensifies civil war in Syria. It could be another Lebanon. It’s two sides of the same coin: It can either offer Assad opportunities to exploit foreign involvement, or it can ultimately be the nail in his coffin. I’m guessing, sadly, that one thing Syria will not face a shortage of is shrouds and coffins. In his latest public speech, Syria’s President Bashar al-Assad sounded a lot more like the late Colonel Qaddafi, who threatened to crush his opponents mercilessly. Where Qaddafi threatened to go door-to-door, house-to-house, and alley-to-alley – and made good on his threats – Assad is now saying he will crush his opponents with an “iron hand.” Assad started off in the early stages of the Syrian uprising sounding very delusional and detached from the reality on the ground, to the point of making ridiculous claims in his interview with Barbara Walters a few weeks ago. He attempted to dissociate his presidency from the authority and responsibility of giving orders to, and controlling, the state security forces. But, he fooled no one. The critical question for the international community is whether or not the “R2P” (Responsibility to Protect civilians) UN mandate applies to the Syrian case. 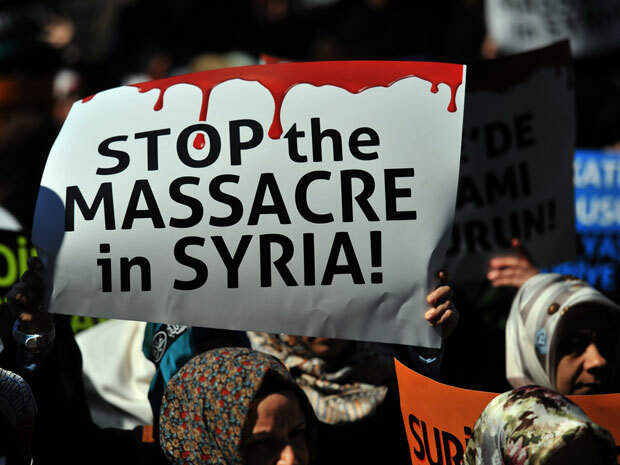 With 5,000+ casualties (mostly civilians), the protesters in Syria have been pleading with the international community to apply the R2P mandate and protect them from Assad’s ruthless crackdown. Nonetheless, Assad clearly is not applying lessons learned from the 2011 Arab uprisings and revolts. Perhaps denial and delusions of grandeur and invincibility are in the DNA of dictators.